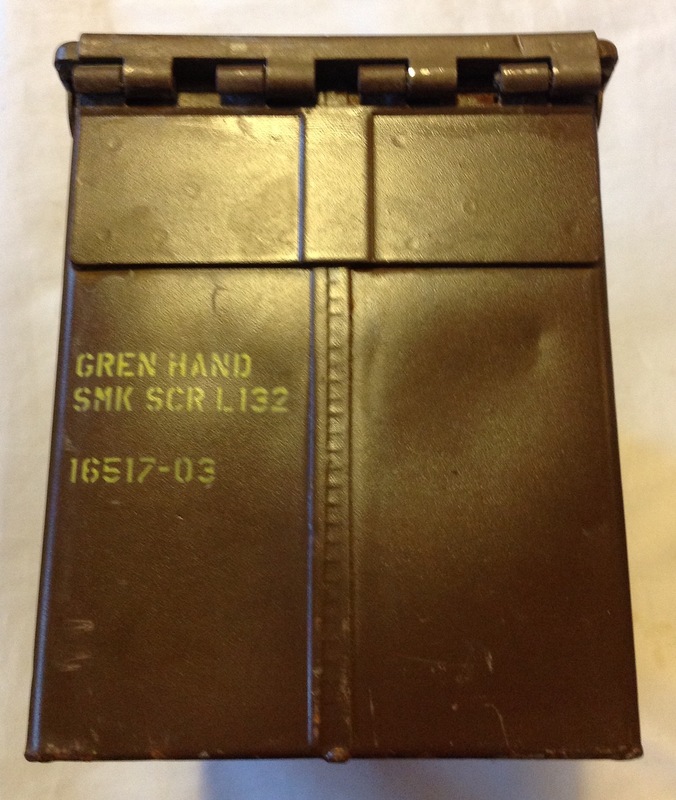 Most post-war ammunition boxes you come across form British small arms rounds are painted green, with details stencilled on in yellow. 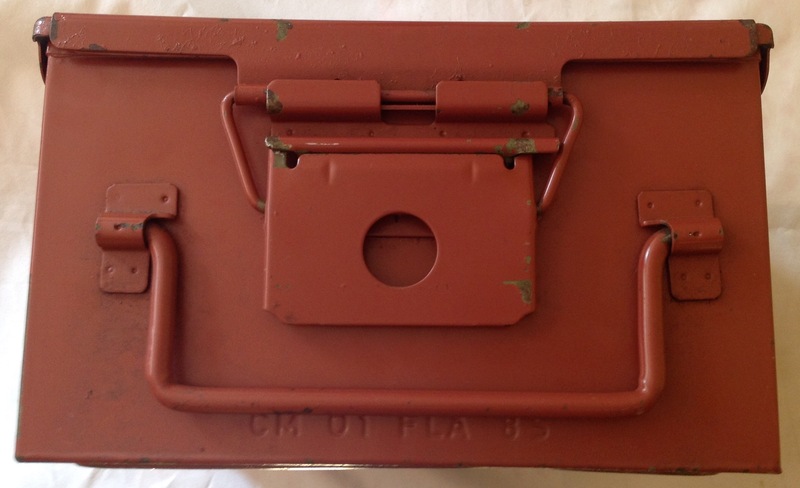 It was therefore somewhat surprising to be given a box in red oxide that the previous owner assured me had been rescued form a British Army dump many years before: Further research, and the help of an old friend, revealed that the box was Belgian in origin, but produced under contract for the British. This then explained the odd size and colour compared to normal British boxes! The design of the box is very square in profile, with a heavy duty metal handle on two sides. 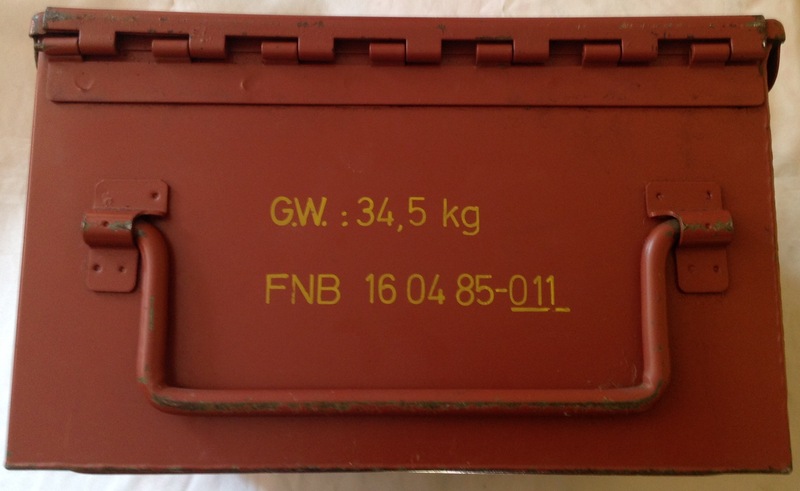 One of the sides with a handle has a large spring clip for securing the lid: The opposite side is stencilled up with the boxes weight and the initials FNB indicating that the ammunition was made by Fabrique Nationale, Belgium: The date of packing is marked on as 16th April 1985. 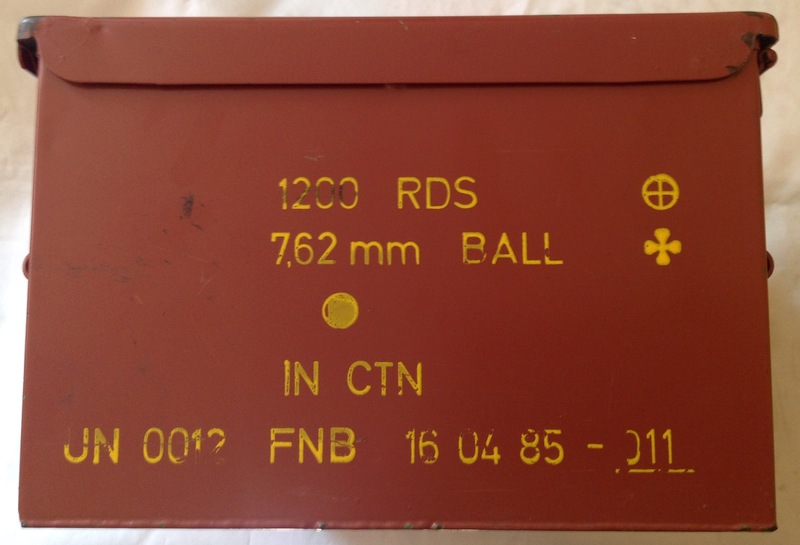 The date is repeated on one of the sides of the box along with details of the original contents: From this we can see that the box held 1200 rounds of 7.62mm ball ammunition in cartons. 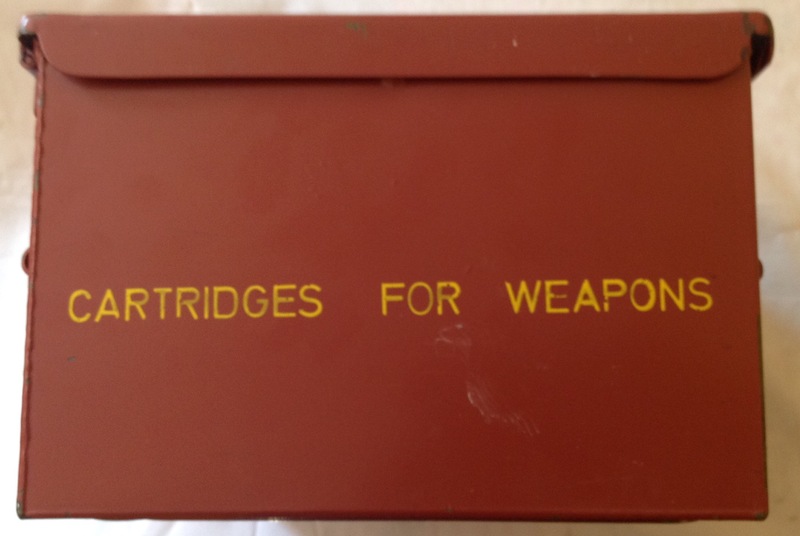 The four and final side of the box is marked up with the words ‘Cartridges for Weapons’: Although Britain has long produced its own ammunition at factories such as Radway Green, at times it has supplemented this manufacture with foreign contracts. Sometimes it would have been because the ammunition was a specialist type and it was not cost effective to set up a full production line for it, at others the factories in the UK were too busy producing other ammunition. In 1985 I suspect that the UK factories were flat out producing 5.56 rounds for the newly introduced SA80 in order to build up a stockpile in warehouses for the new weapon. As such they would not have had capacity to produced 7.62mm rounds and so the British Government turned to FN to fill the shortfall. My thanks go to Ian Ward for kindly giving me this box. This entry was posted in Ammunition Box, British Army, Post WW2 on November 23, 2018 by hatchfive. Of all the ammunition boxes in my collection, the B.166 is the most useful as its large size means I can pack a lot of kit inside it for storage. I now have three of this particular type of box and none have cost me more than £10 each. This entry was posted in Ammunition Box, British Army, WW2 on May 21, 2018 by hatchfive. 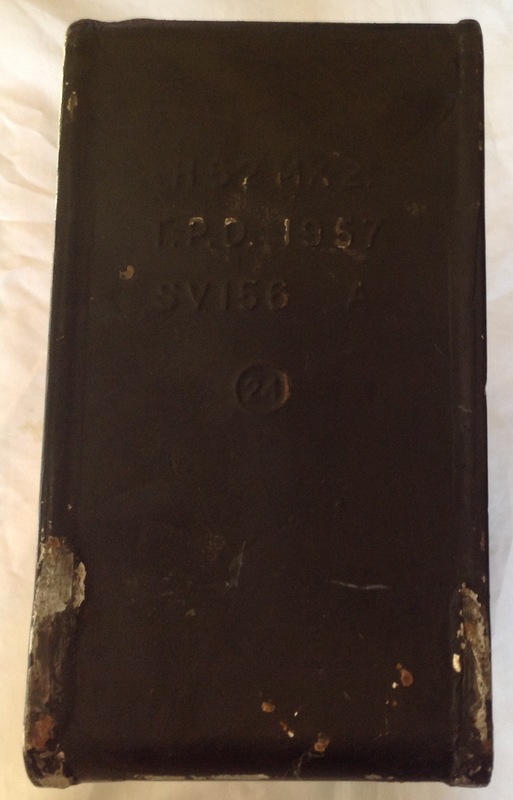 Continuing our look at a selection of British Army ammunition boxes from the Second World War, tonight we have an example of the ‘P60’ box: This box is unusually shallow in depth and originally held four projectiles for the 25 pounder field gun. The 25 pounder used separate projectiles and propellant cases, the gunners adding or removing charge bags to alter range. The projectiles were packaged into separate metal ammunition boxes for safety and this is an example of one of these and was used for armour piercing shells. The box’s designation can be seen embossed into the lid: ‘MC’ would be the manufacturer’s mark and I suspect this might be Morris Cars but I cannot be sure yet; this box dates back to 1943. 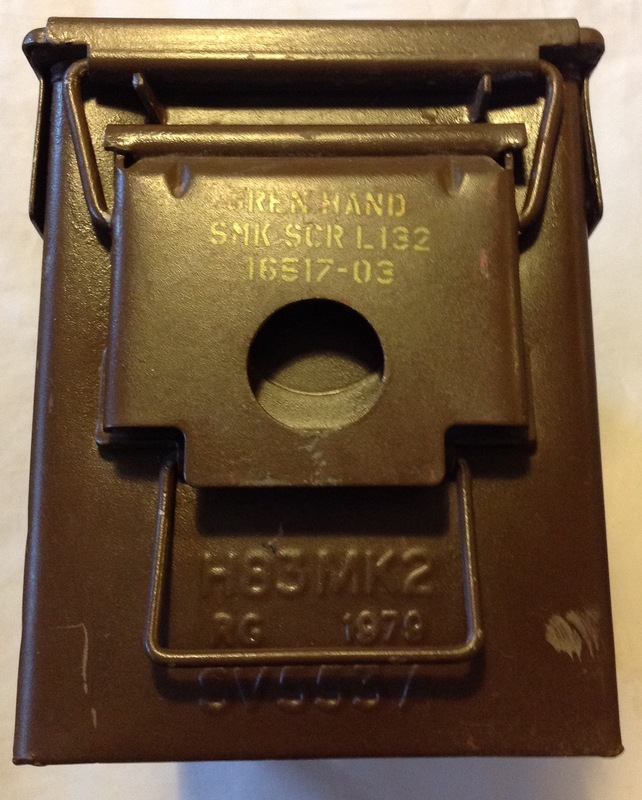 Apart from its shape the box is pretty conventional and has metal handles at both ends for carrying it: Note that as a later box this does not have the rubber grips of the M104 we looked at a few weeks back. The lid is secured with two heavy duty hinges: And a pair of wire spring clips: This particular box is one of the more common to find, the 25 pounder remaining in service for many years after the Second World War, this example survived as a tool chest and has been repainted by me back into it’s original service-brown colour. Ammunition for the 25 pounder was normally held in a special armoured limber that was pulled behind the quad tractor. These limbers had their own ammunition trays and were armoured for use in a battlefield, therefore it would have been the job of the gun crew to replenish these armoured limbers form ammunition boxes such as this one during quiet times so as to keep the gun fed during battle. This entry was posted in Ammunition Box, British Army, WW2 on March 23, 2018 by hatchfive. 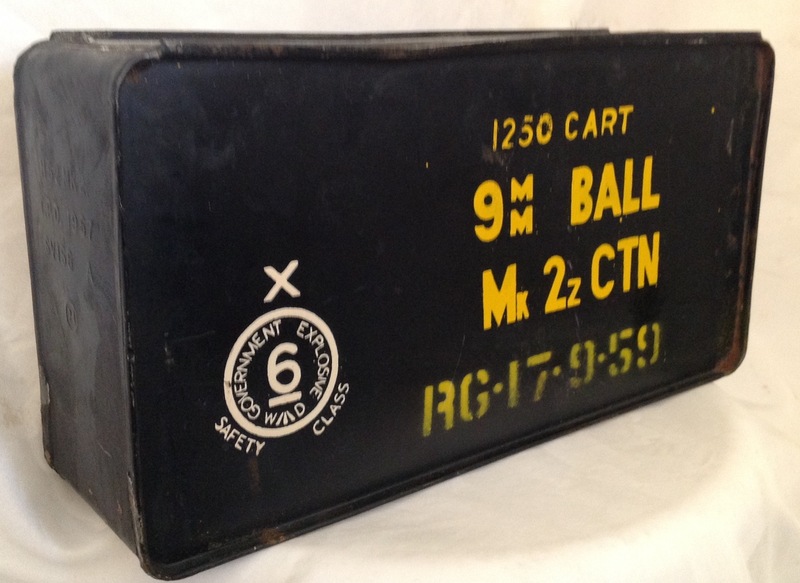 It has been a while since we looked at any ammunition boxes on the blog. Tonight we have the first wartime box I ever picked up. 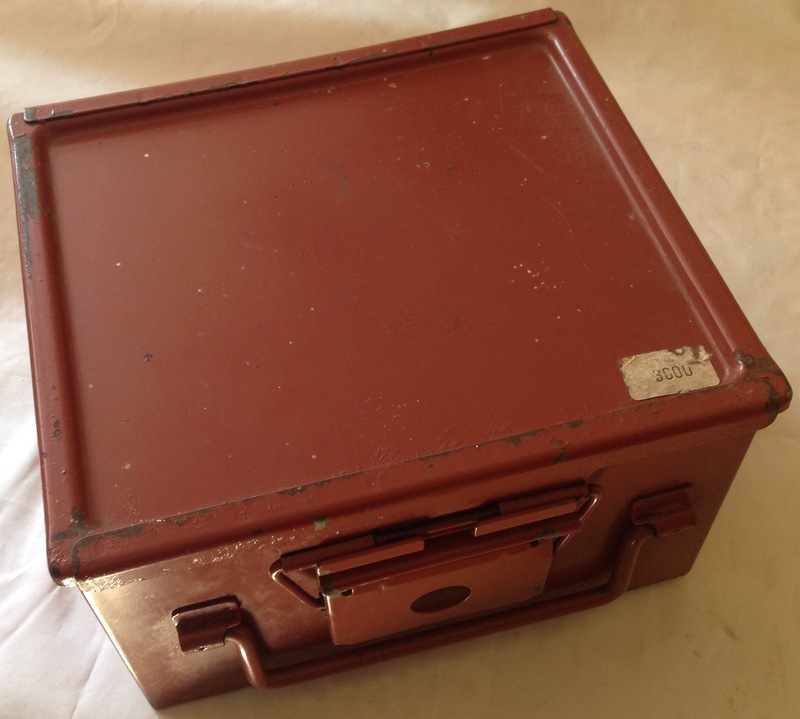 When I first acquired this box it was painted black and had clearly been used for a tool box at some time. Since then I have stripped it back and repainted it in ‘service brown’ and applied some markings. 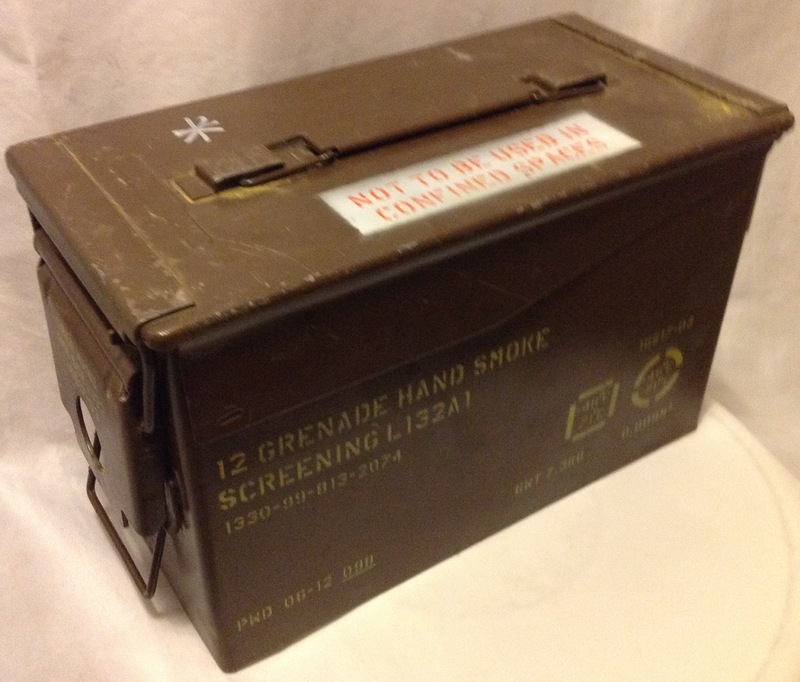 These are based off an original example of the box and although a little crude (I am not that good at cutting out stencils with a Stanley knife) they really help the box look the part: This box is stamped into the top with its designations ‘M104’: This type of box was used for carrying fuzes for artillery shells, either the 117 fuze for 25 pounders or the No213 fuze. This fuze was used for high explosive and bursting smoke rounds for the 25 pounder, 5.5 and 7.2 inch guns and was both timer delayed and percussion fired. For an excellent information sheet on this fuze, please look here. The other use it saw was to carry the ammunition shell for ‘U’ type 3” rockets. Originally the box would have had cardboard inserts to protect the contents and hold them securely for transit. This entry was posted in Ammunition Box, British Army, equipment, WW2 on March 3, 2018 by hatchfive. 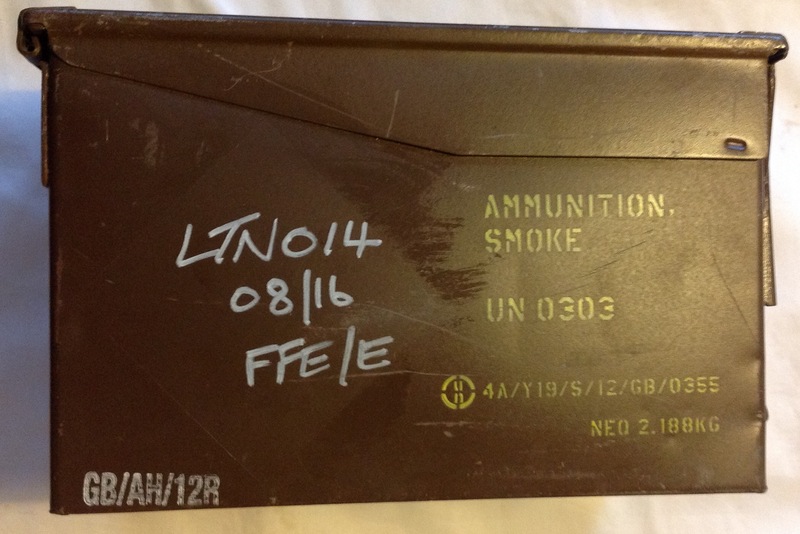 At the start of last year I looked at a wooden H51 ammunition box here. These boxes are fairly common, what is far rarer is the sealed metal container that went inside each of these boxes, the H52 box. I was lucky enough to pick up one of these, opened, last week and the condition of this tin is fantastic: The container is made of pressed tin, soldered together and painted black. 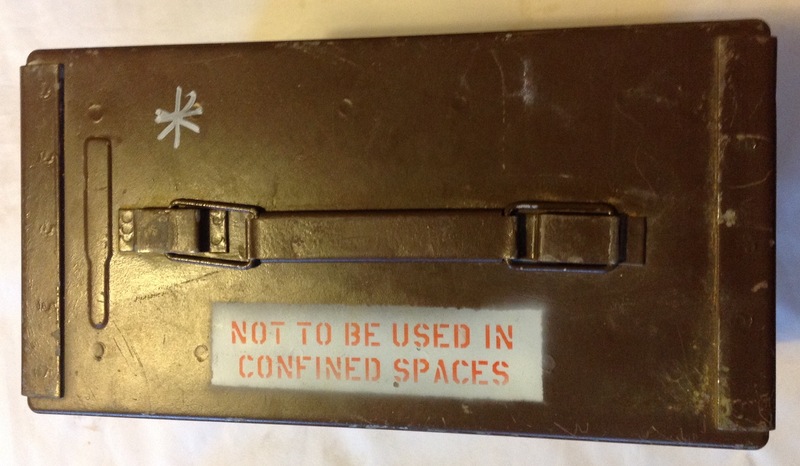 The main markings on the front indicate that it was used to hold 9mm ammunition and held 1250 cartridges in Mk 2z cartons: Beneath this is stencilled ‘RG’ for the Radway Green arsenal and the packaging date of 17th September 1959. The large white marking is a standard Government Explosives classification marking used to ensure that the ammunition is handled correctly and stored in suitable conditions to prevent deterioration or danger. 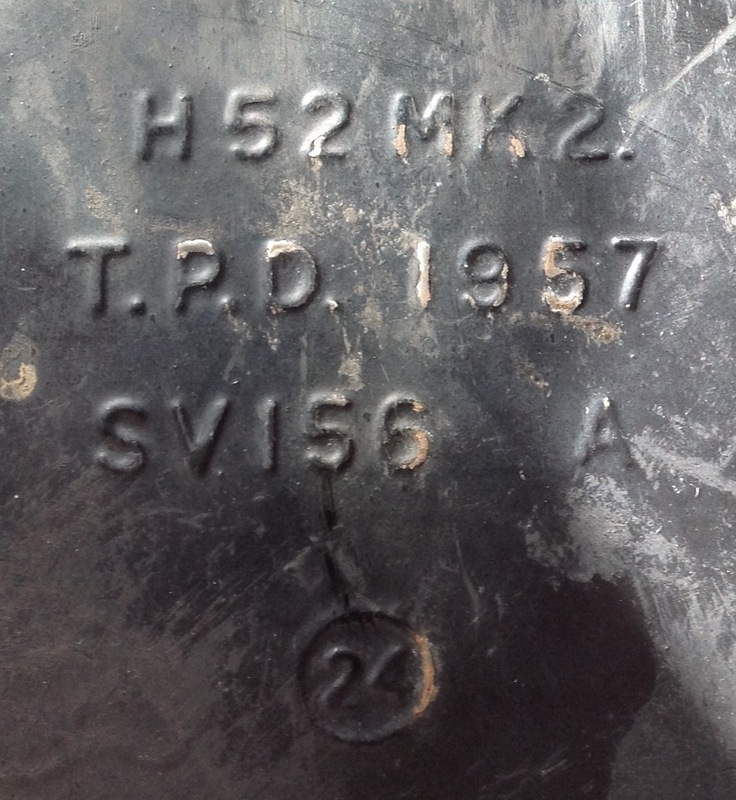 The container itself is stamped on one end: These stamps indicate the box type, H52 Mk 2, and a manufacture date for the tin (as opposed to the filling date on the front) of 1957: The can was soldered shut with a pull tab lid to open, which has been pulled off and discarded from this can: These cans were fitted into the wooden H51 box, with spacers made from wood and sorbo-rubber that helped keep it tight and prevented it from moving around. Two of these H51 boxes then fitted into a metal H50 box. 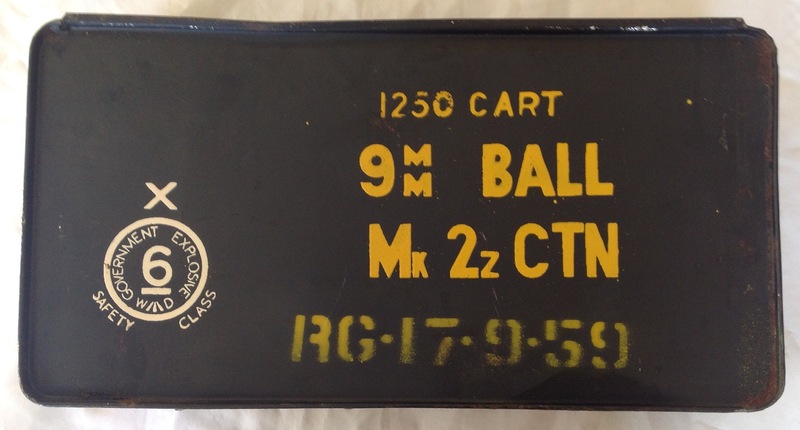 A quick trawl of the net suggests this carton is rather rare- presumably most were just thrown away as they are not easily reusable in the way other ammunition boxes are. Either way it is a great addition to the collection. This entry was posted in Ammunition Box, British Army, Post WW2, Weapons on March 29, 2017 by hatchfive. 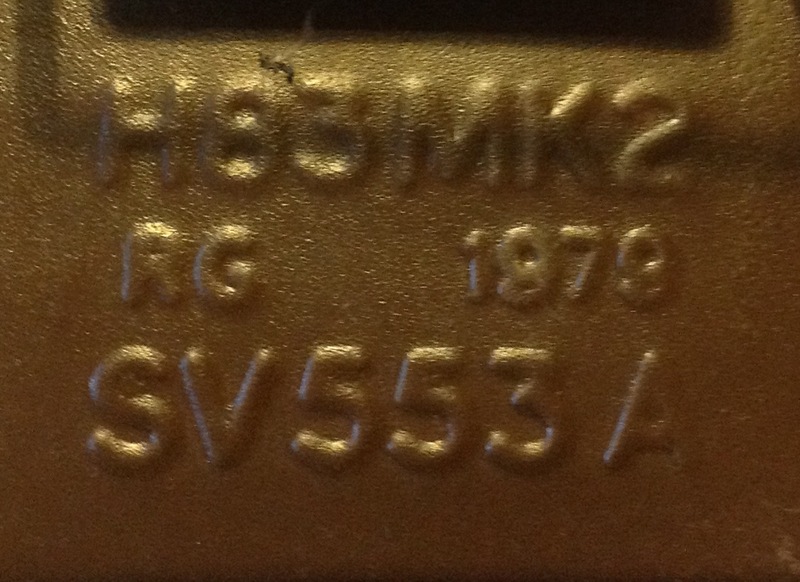 Update: Sean Featherstone has kindly been in touch to help with the markings on this box and given me a lot more information about their meaning. I have updated the text below to reflect his information. The Certification Free From Explosives (CFFE) regime is applicable to all packages which have contained explosives, arisings from the firing or proofing of ammunition, munitions kept in museums or as souvenirs and displays etc, and for training aids, all arisings from breakdown and disposal of ammunition and explosives and platforms and any other equipment expected to use or hold munitions. It is also applicable to equipment used to process explosives and subsequently in need of maintenance or repair. CFFE is required when such items are to be transported as non-explosives or sent to recipients for re-cycling who, because of a complete lack of knowledge of explosives, would be at risk if explosives were to be inadvertently left in a nominally empty article or package. Those at particular risk are people outside of the MoD and those who receive items for scrap. The same regime should also be used to ensure the absence of other hazardous substances e.g. White and Red Phosphorus and CS which may be associated with the Munitions. 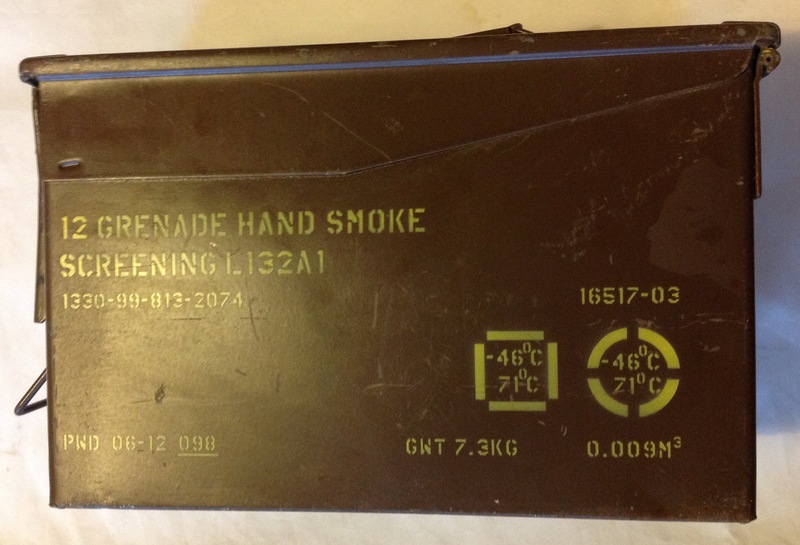 The lid of the ammunition box has a large warning that the smoke grenades are not to be used in a confined space: The hinge end of the box repeats the contents so they can be identified quickly regardless of how the boxes are stacked on a pallet: The nature of the ammunition tin means that the fourth side of the tin has to have the details printed on the large catch: As can be seen, for those of a geeky nature (which I am guessing is a lot of you), there is a lot of information that can be pulled off from the markings on these modern boxes. Whilst I am certainly not going to pick up loads of them, I will continue to keep an eye out for attractively marked examples. This entry was posted in Ammunition Box, British Army, Post WW2, Weapons on February 16, 2017 by hatchfive.